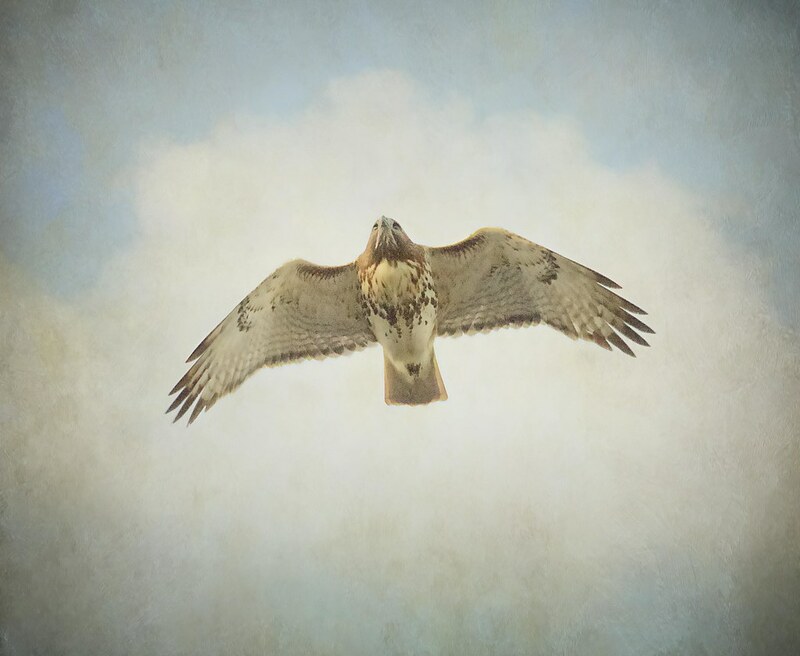 The dark/cloudy/foggy weather lately has made photographing birds difficult, and I've been waiting unsuccessfully for a sunny day to get some decent hawk photos. 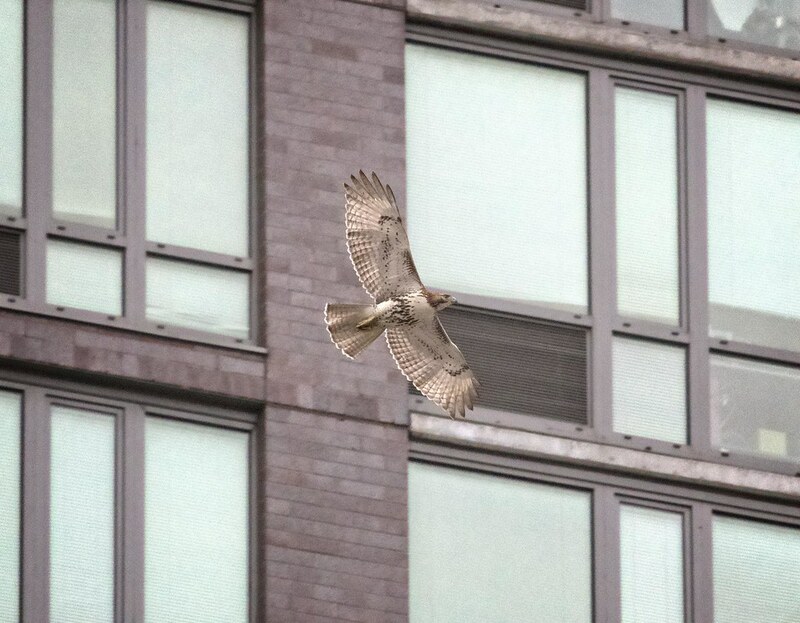 But there's been a lot of raptor activity in the East Village/Lower East Side recently, so here is one big update. 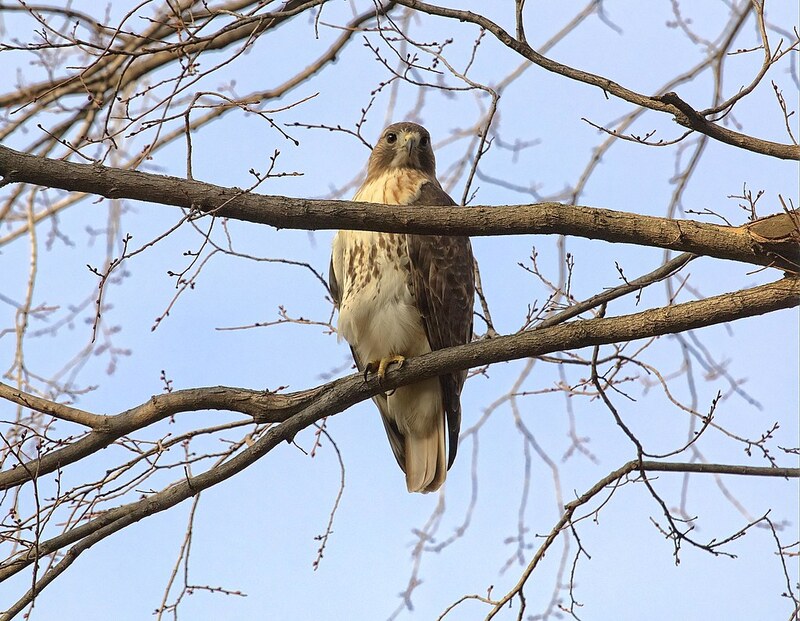 One exciting bit of news is it's been confirmed that there is a new pair of adult red-tailed hawks hanging around the Lower East Side. 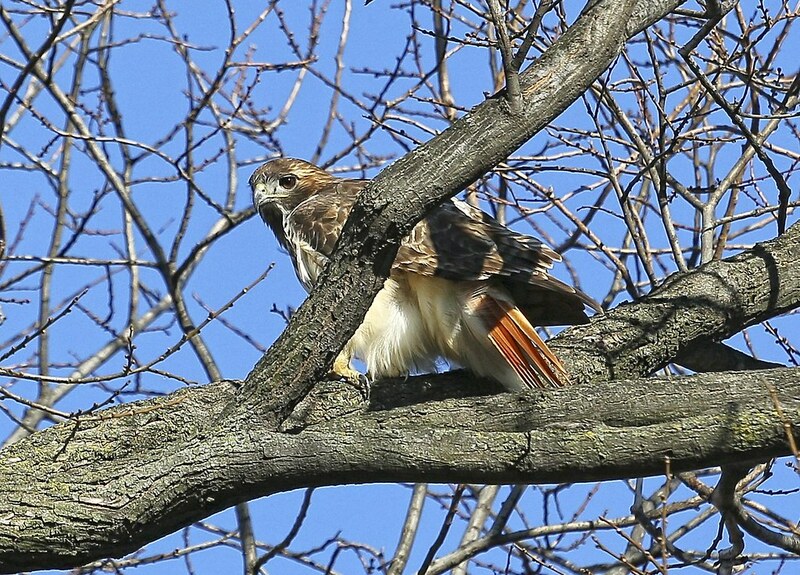 For the last few weeks, there have been many sightings of red-tails around Grand Street, but we (hawk-watchers) weren't sure if these birds were Christo and Dora, or tourist hawks. We've never been quite sure how far south Christo and Dora's territory goes, and there's no reason why they wouldn't fly around there. 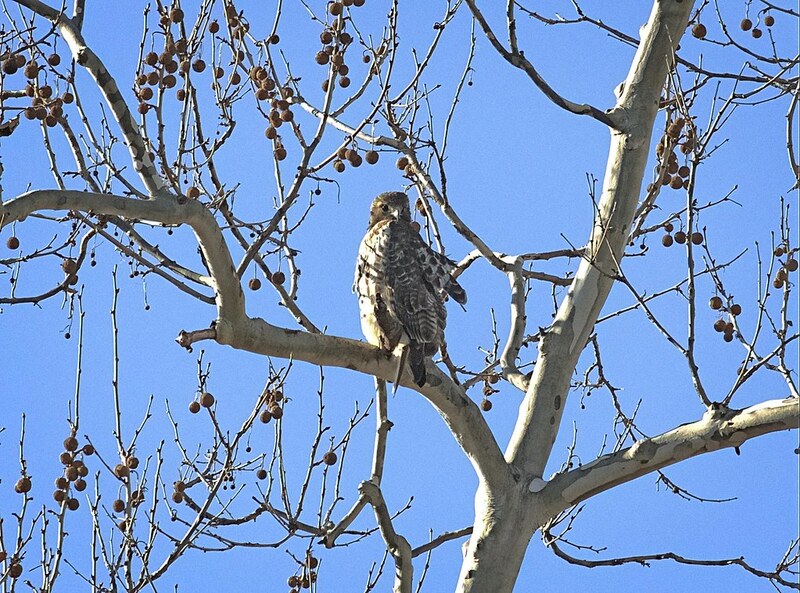 Last Friday, a fellow hawk-watcher spotted a pair perched atop a building at Clinton and Grand Streets. He then ran over to Allen, where he could see up the avenue to Village View at 4th Street, where Christo and Dora were perched in their usual spot. He then ran back to Clinton and Grand and saw that the other pair was still where he left them. 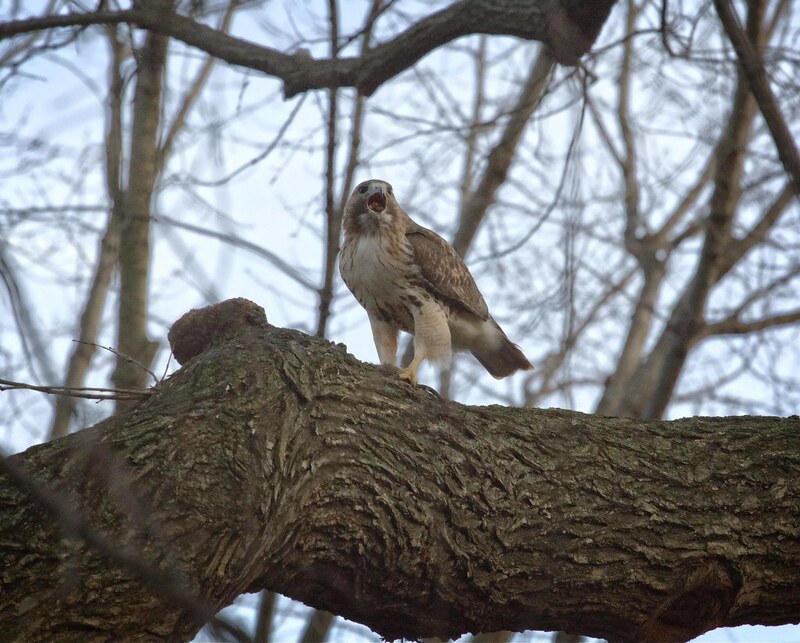 Whether they will decide to take up permanent residence, no one knows yet, but I'm thrilled at the prospect of another hawk family in the area (local rats are reportedly not as thrilled). 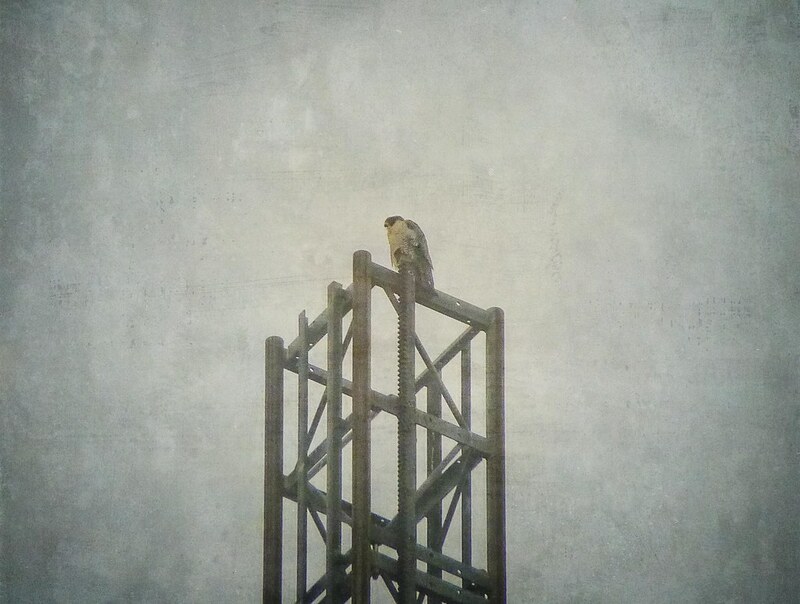 Later this afternoon, I saw what I believe to be the same bird perched on a pole at Grand and Suffolk. It stayed there a few minutes before flying far east on Grand. Meanwhile, Christo and Dora have both been spending a good amount of time in Tompkins Square. I tend to see them late in the day either at or after sunset. On several occasions, I've seen them both go to roost in the park. Tonight (Christmas Eve), Christo went to roost in the Krishna tree, near the lit-up Christmas tree (I was really hoping he'd make himself the Christmas tree topper, but no such luck). The following photos are from the last few days. Here is Christo digesting his dinner late in the evening in the big elm near Avenue And 7th Street. 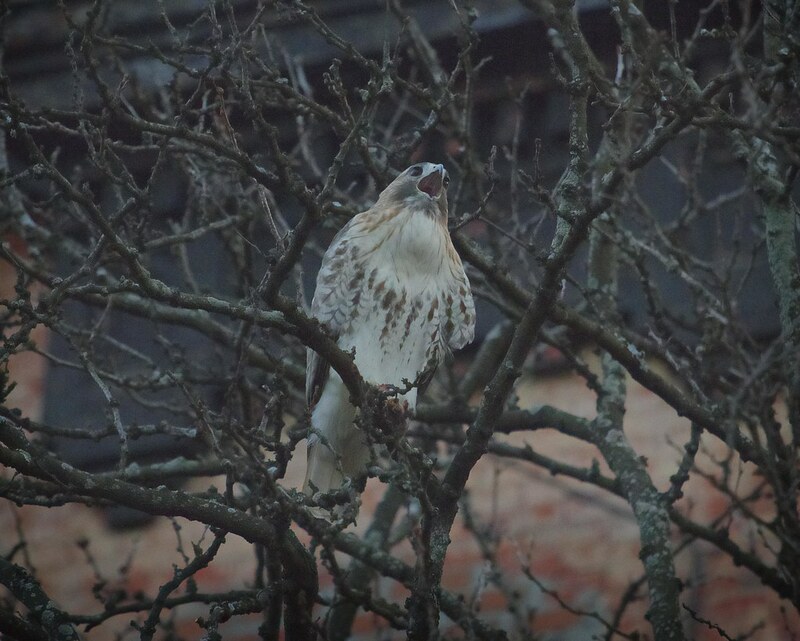 Dora is perched in the tree above and behind him. He deftly nabbed a rat along Avenue A. The colored clouds in the foreground are the result of me being trapped behind a rose bush. After dinner, Christo called to Dora from a tree along 7th Street. You can see his crop (the bulge in his chest) is full. Still calling, he took off after her. Here she is, Miss America Dora, in her favorite sycamore at Avenue A and St Mark's Place. This is about as close as she lets me get to her. 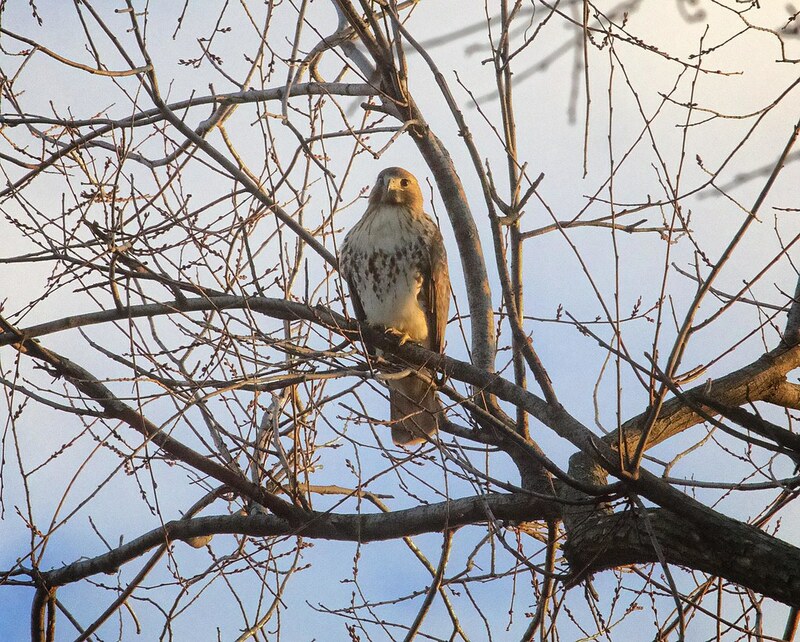 For some time, I've been catching glimpses of a Cooper's hawk around the park, especially along Avenue A. I was just beginning to think I was imagining things, when a Cooper's zipped by late one afternoon. The Cooper's is really fast and agile, so by the time I see it and raise my camera, it's usually already out of sight. 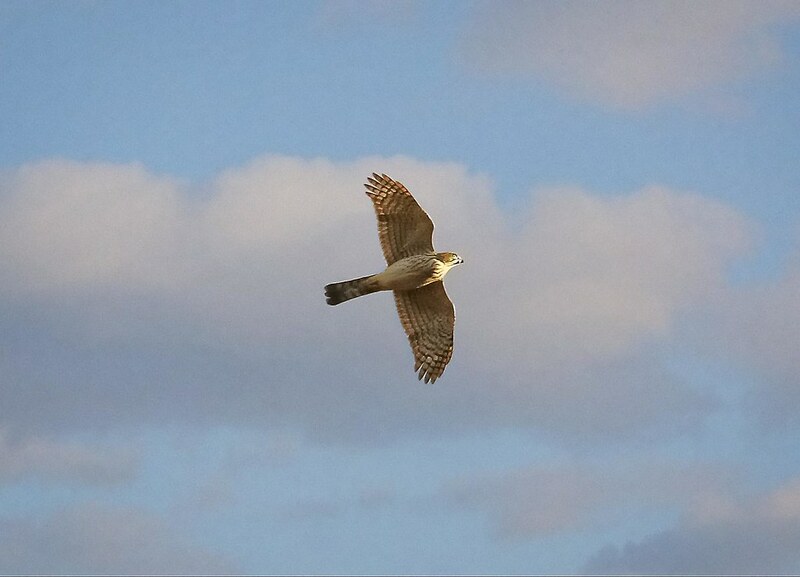 Speaking of fast flyers, I've been seeing more of the Peregrine falcon that has been hanging around the area. 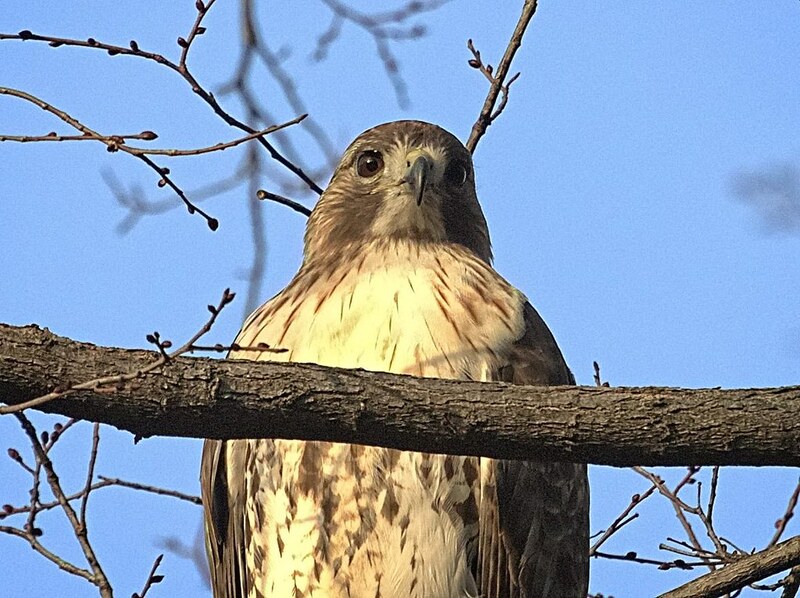 I'm almost certain this is the same falcon that's been seen on Allen Street, Bowery, First Avenue and around Tompkins Square. It's been troublesome to photograph as it's usually very high up and far away (and I never have the right camera with me when I see it). Wednesday morning, when it was so foggy I couldn't see beyond the sixth floor of any building, I happened to spot it perched on a construction tower at Allen and Rivington. 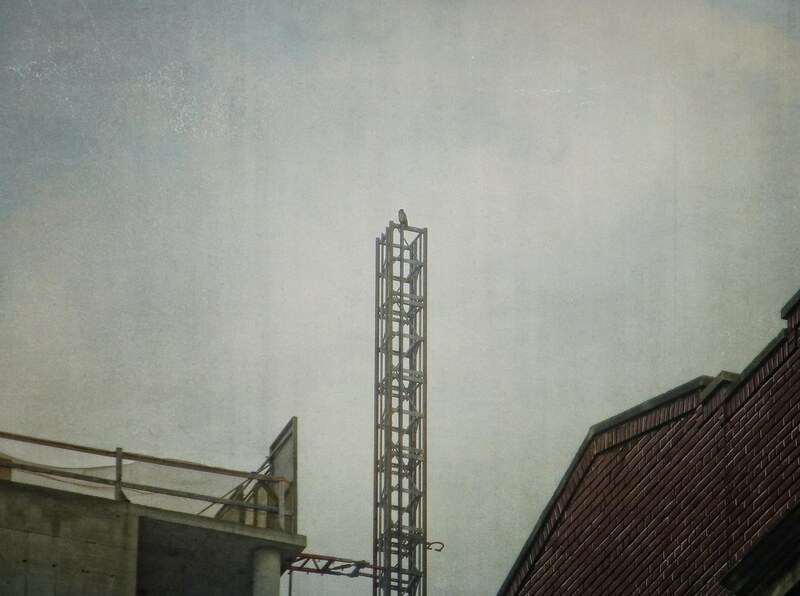 I saw Christo perched on the same tower a couple of weeks ago and, at first, I thought it was him. But, closer inspection revealed the telltale markings of a Peregrine. 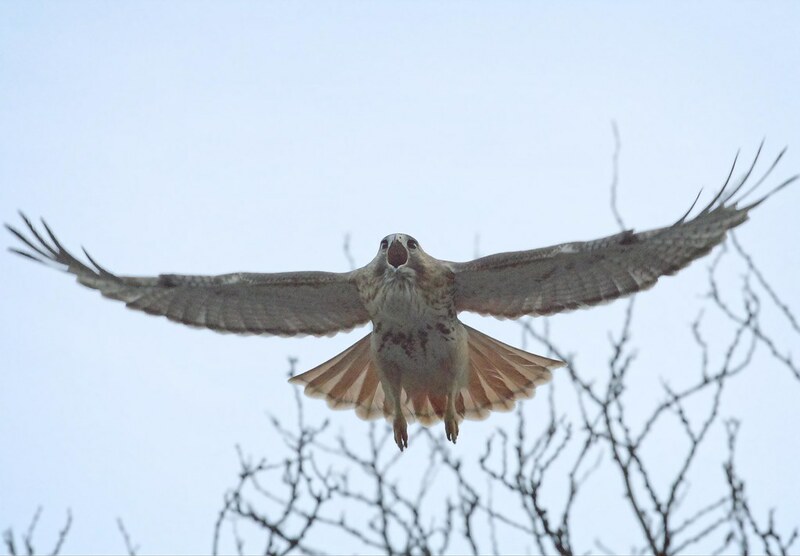 This video, taken from Orchard and Rivington Streets, shows the falcon taking off and you can see its pointed wings. 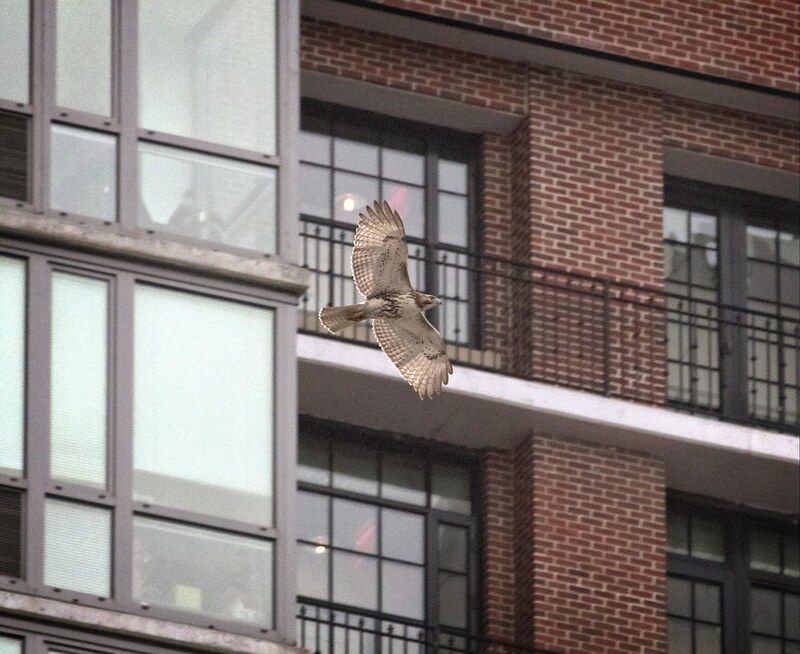 It flew NE towards Avenue A and Houston. 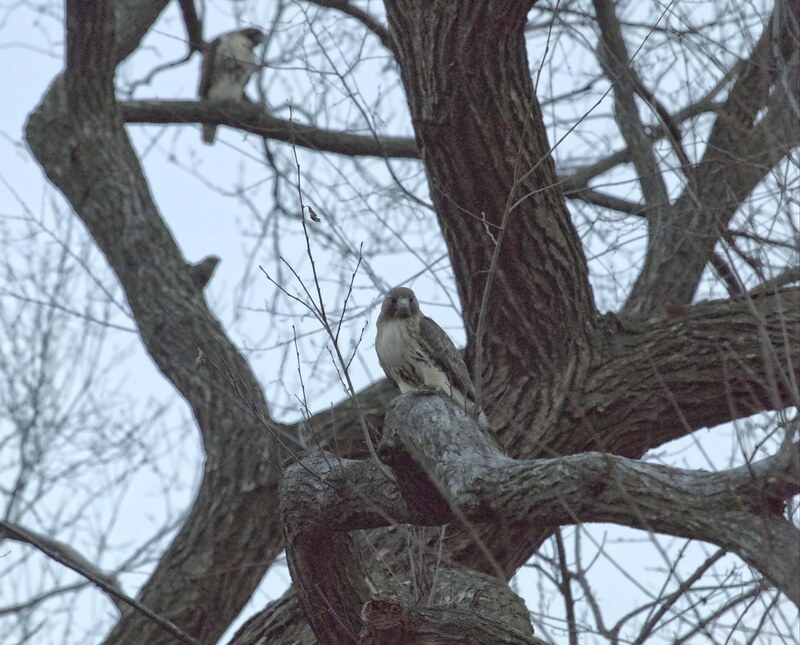 A few minutes later, on the same frustratingly foggy morning, I came across two kestrels on Division Street. I believe they are the same pair who nested in the area last summer. I was excited to see both of them, and they were flying around like crazy. I never saw them catch any food or go after any other birds, so I don't know why they were so energized. Here's one of them on Pike and East Broadway. This video shows both of them - the female is on the left and the male is on the right. One more shot of Christo! 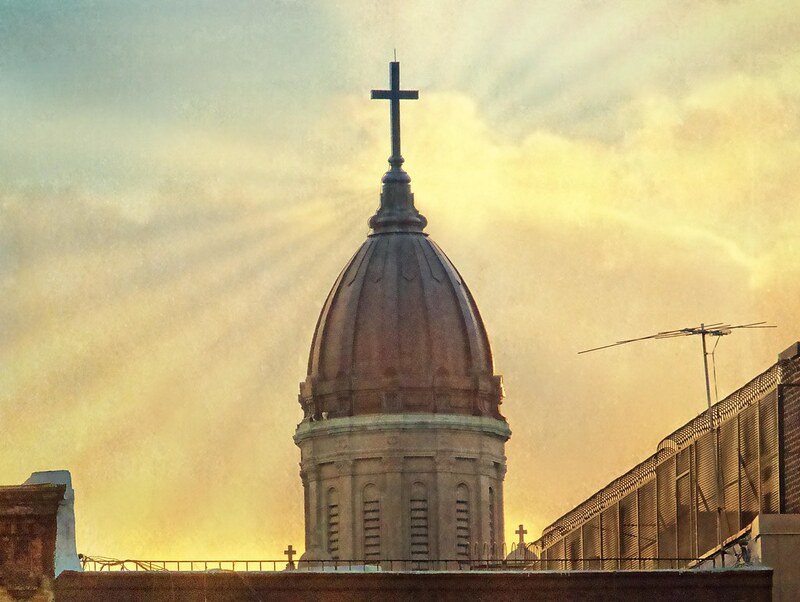 After an afternoon searching high and low for Christo and Dora, I finally found them in one of their favorite spots atop Most Holy Redeemer Church on E 3rd Street. 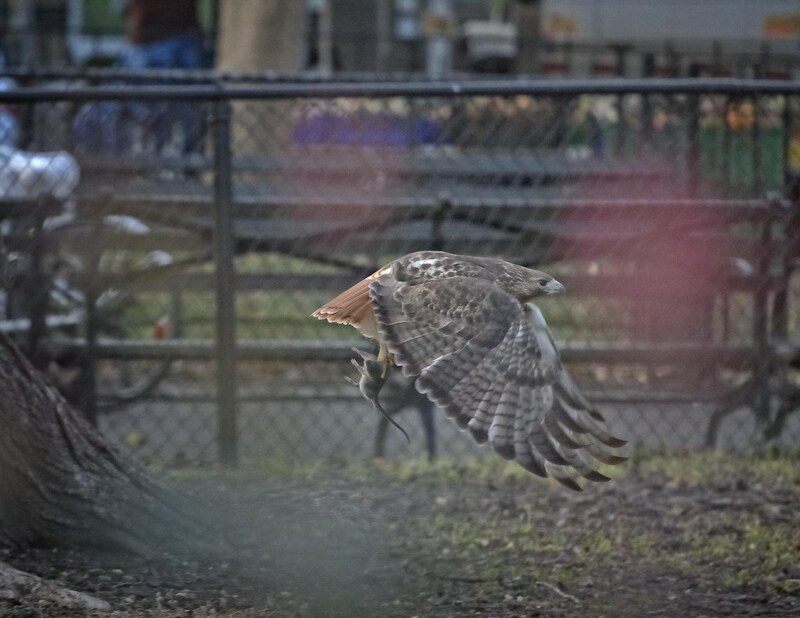 This was taken from Tompkins Square, and the hawks are the tiny white blobs at the base of the dome on the left, just above the green band. 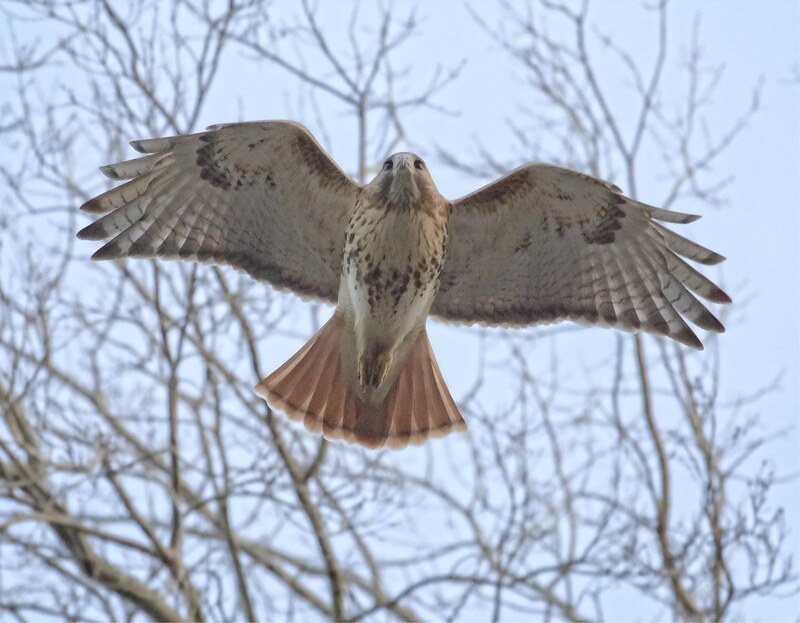 All this raptor activity gives me hope that we'll see much more of all these birds in the coming year.